Preheat oven to 400. Quarter and seperate the pita. Top with cheese and bake on a lined cookie sheet for 5-7 minutes or until crisp. Serve with humus. Well, my morning fell a little.....flat. The Mays are home! 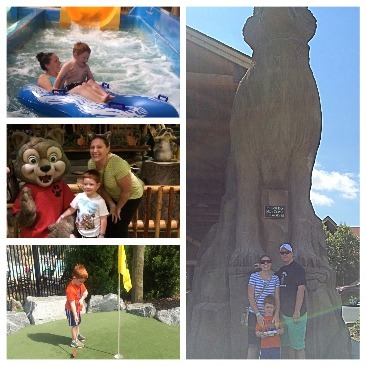 We had a blast celebrating Tucker's birthday at his favorite place on planet earth, The Great Wolf Lodge. We are home for a couple days before we hit the road again for an out of town wedding. This morning me and Tucker were on our way to Trader Joe's to pick up some supplies to get us through the couple days we'll be here, when something just didn't feel right. At first I thought one of Tucker's toys was stuck up under my car, so right after I backed out of our driveway, I got out and checked. Not a toy. Nope, one flat as a pancake tire.....awesome. I called my superhero husband to the rescue, and he rushed home from work to save his damsel in distress (the man is a saint). Needless to say we were a little late to the grocery store. While shopping I knew that once I got home I would have about 4 minutes untill the "Mom, I'm hungry" started. So, I made sure to pick up some super quick lunch options that I could also use for our dinners over the next few days. There's nothing more annoying to me than buying ingredients that can only be used for one dish (because then you're stuck with all the leftovers which of course you eventually toss because they go rancid before you use them again). He requested "ants on a log", DONE! 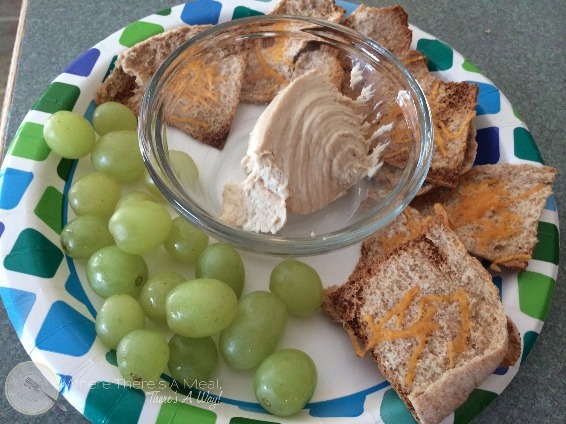 I had almond butter and crasins at home so all I needed was the celery (that I can use in another meal). Then I grabbed some humus and fresh pitas. I knew my boys would have no problem eating a small container of humus and I needed pitas anyway for my Chicken Fajita Pitas that I'm making tomorrow. Yes, a quick lunch with no wasted groceries (or money). Next time your at the grocery store with a hungry shopper (yourself included) stop before you buy a bunch of random stuff, and think about what you're making over the next couple days and create a meal from the ingreditents you are already getting (it will save you time and money). Even if you have a flat tire, and are running late for lunch, where there's a meal, there's a way! 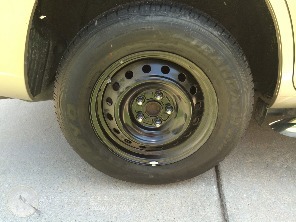 Running my errands with my spare tire, rolling in style. Someone call an exterminator! We've got Ants on a Log! 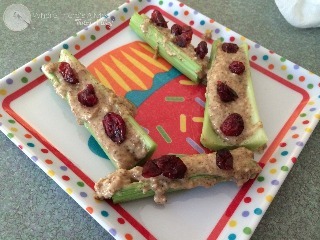 Ants on a Log are one of the easiest healthy treats to make (they're also gluten free and vegan). But what if you have a little one who isn't into them? To get Tucker to try this, first I had him help me assemble them. Then I told him to pretend they were REAL ants and the only way we could get rid of all these "evil ants" was if the exterminator (him) ate them! Victory! He loved it! If there is an fun enough story to go behind a new food, picky eaters just might give it a try.